Description: The qGen1 (quantitative genetics) experiment investigates the heritability of traits in Echinacea angustifolia. During the summer of 2002 we crossed plants from the 1996 & 1997 cohorts of exPt1. We harvested heads, dissected achenes, and germinated seeds over the winter. In the Spring of 2003 we planted the resulting 4468 seedlings (this great number gave rise to this experiment’s nickname “big batch”). We annually assess the survival and fitness of these plants in exPt1. A head bagged & ready for crossing. Products: We have an awesome dataset that we will share once the paper is published. Ruth Shaw is working on an analysis of the qGen1 dataset. 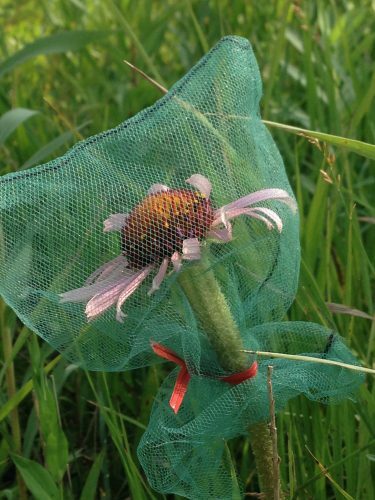 Link to flog posts: Read updates about experiment qgen1 on our flog (field blog) as written by members of Team Echinacea.